In 1996 the European commission (EC) financed the feasibility and technical study for regional interconnection of the electricity grids in Jordan, Egypt, Israel, and Palestine. In that project, there was a part called the "Palestinian Master Plan" concerning the design of the electrical system for Palestine. Taking into consideration all the factors that effect the expected electrical needs for Palestine till year 2015. The following table shows that load forecast. A tender Document was prepared by PEA for Gaza Pwoer Plant with 110 MW combined cycle under a turnkey supply conditions. PEA and the IPP developer negotiated the required agreement between each other and turnkey supplier to finalize them. It is expected to have the first simple cycle turbine in the areas of the end of 1999. The PEA role in the generation issues is a regulatory role, this is accordance with the letter of sectop policy.PEA is seeking technical assistance in the earea of tariffs, regulation, and power purchase agreements . The transmission system designed to cover the expected loads in the region of West Bank and Gaza Strip. Sweden (Sida) has expressed interest in funding the first part of the Palestinian Transmission System (Gaza Transmission System ). Norconsult prepared tender documents under NORAD fund and tender documents are now under final revision. 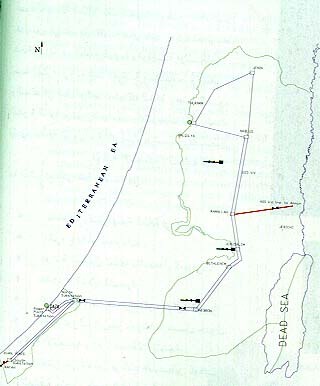 It is expected that constructing the Gaza Transmission System will be started during 1999 year. The plan stressed that the unified Palestinian electrical system consists of 220 KV line for both West Bank and Gaza Strip, thus their was a 220 KV line connecting the two systems. The technical study chose the 220KV transmission voltage to connect all the load centers in palestine.The following figure illustrates the proposed transmission system. Funded by word bank the Britain investment company" Kenedy and DonKen" has prepared study for Palestinian electricity, about electric load forcast on the mid and long term for Generation, transmission, and distribution.